The test will check Cholesterol, HDL, LDL, Triglycerides, hs-CRP, and HbA1c and a physician will review the results for a healthy heart, chronic inflammation, and risk of developing diabetes. What is a Heart Health test? A Heart Health test, also called a total cholesterol test or a lipid profile test determines the risk of heart disease from plaque build up in the arteries. Low density lipoprotein (LDL) cholesterol: The ‘bad’ cholesterol that builds up fatty deposits of plaque and blocks the arteries increasing the risk of heart attack. High density lipoprotein (HDL) cholesterol: The ‘good’ cholesterol that carries away LDL and helps arteries clear of plaque. Total cholesterol: This is the sum of blood’s cholesterol content. Triglycerides: A type of fat stored in blood from the excess calories we consume. High triglycerides result from excess body fat, sedentary lifestyle, high consumption of sugar, alcohol or from smoking or diabetes. hs-CRP: The high-sensitivity C-Reactive Protein can detect low levels of inflammation that is associated with risks of developing heart diseases, especially for those with family history of heart problems or previous strokes. HbA1c: A measure of glucose levels over last 3 months and known to be a good indicator of developing diabetes in future. How to get tested for cholesterol and heart health? The easiest low-cost way to get tested for Cholesterol and heart health is from the convenience of your home. Simply order a Cholesterol and heart health test kit, collect a few drops of blood (using finger prick) on a tissue paper, send your sample to our CLIA-certified labs, and find out your levels in less than a week. For a short description of the Cholesterol test, you can read the Mayo Clinic page on Cholesterol test. For understanding the role of hs-CRP in cardiovascular diseases, read Webmd’s page on CRP test. You can also order a separate at-home HbA1c test or an at-home Vitamin D and inflammation test. A: The kit for our at-home Cholesterol and Heart Health test contains a blood card to collect few droplets of blood, a pair of lancets for finger-pricking, instructions on how to collect the sample, and a form requesting basic information including date and time of collection. The directions are straight forward and easy to follow. A: The report with your test results will be easy to understand and will have all the necessary details. It will mark your levels for HDL, LDL, total cholesterol, triglycerides, hs-CRP, and HbA1c on a range expected for healthy levels. The report will also specify what are the expected low and high ranges. It will briefly discuss what your numbers mean and what next steps should be taken to maintain healthy levels. A quick Cholesterol and Heart Health test ordered from home can help check your cardiovascular health and assess whether you need to make any life style changes to bring your numbers to normally recommended levels for your age. 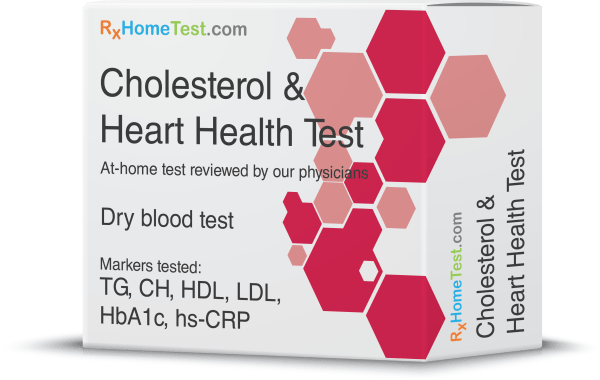 At-home Cholesterol and heart Health test from RxHomeTest.com can help you understand potential cardiovascular risks arising from any inflammation of coronary arteries and potential heart diseases. High levels of hs-CRP are indicators of several autoimmune diseases that result in chronic inflammation not easily identifiable in any other way. An at-home Cholesterol and Heart Health test can help you assess your levels right from the comfort of your home. Better health results in better quality of life, and a regular at-home Cholesterol and heart health test from RxHomeTest.com can offer insight not only into various health symptoms, but it can serve as a motivation to treat each of these symptoms and have a better quality of life! Still wondering where to get a Cholesterol and Heart Health test? RxHomeTest.com is one of the best places to get Cholesterol and lipid levels tested as we process your tests at the same CLIA-Certified labs that other physicians use but no lab or doctor visit is required. So rest assured that your blood test to check Cholesterol levels is being processed in a world class lab. RxHomeTest.com offers one of the best tests for Cholesterol and lipids with convenient, confidential, and reliable results at some of the lowest prices in the market. At-home Cholesterol and heart health test is quick and easy, can be ordered online, and doesn’t require a doctor’s visit or prescription. This saves time and money on visits to the doctor and the lab. The at-home Cholesterol and heart health test ordered at RxHomeTest.com, requires just few drops of blood using a finger-prick (instead of vials of blood taken through venipuncture). The test includes a doctor’s prescription and review, two day free return shipping, and you get results within a week.